A Google CRM is one that integrates with Gmail and Google’s suite of apps, allowing sales teams to track conversations between Gmail and their CRM. We compared a dozen CRMs based on cost, features and functionality, and customizability to find the six best platforms for a variety of business needs, arriving at the best overall CRM with Gmail integration. Google CRMs, which can also be referred to as Gmail CRMs, are those that integrate well with the popular Google email service. We reviewed a large range of Google CRM options to find those that allow sales reps to easily prospect and communicate using Gmail to help close more deals faster. Price – We compared the costs per user and any upgrade costs for additional users, storage, contacts, and data backup. Gmail Integration – We looked at CRMs with Gmail and G Suite integrations and email features like two-way sync, tracking, scheduling, and Chrome extensions. Contact Management – We examined the platforms’ ability to create, edit, and link contacts and to perform other functions such as emails, calls, and tasks. Pipeline Management – All CRM software, even Google CRMs, should have intuitive pipelines. We compared ease of set up, customization, and whether there were quantity limitations. Ease of Use – We reviewed set up and user interfaces by trialing each of the platforms. Integration – Google CRMs should offer integration options with other platforms such as accounting software, chat, and marketing automation. Automation – We looked at each platform’s ability to automate sales follow-up tasks and marketing tasks such as emailing and lead nurturing. Forecasting and Analytics – We compared each platform’s ability to forecast sales, track goals, and provide data for lead sources, sales rep activities, and conversion metrics. Customer Support – Every Gmail CRM should provide a good level of customer support with a depth of online resources and communities. Customer Satisfaction – We looked at how satisfied customers are overall and what, if any, common issues they had. We think Zoho is the best Gmail CRM because it satisfies all of these criteria. It offers all of the features a small business would need for Gmail power users, such as two-way sync, tracking, scheduling, alerts, and others. Because Zoho offers a suite of business services such as chat, projects, and help desk software, it’s also a good choice for a business wanting additional integrations. Zoho CRM offers G Suite integration and additional selling tools such as sales insights and social media integration to give sales teams an intelligent, all-in-one communications platform. With it, sales teams can prioritize and target prospects using real-time data from email, social, campaigns, and other sources. It’s best for companies that want an all-in-one CRM with the ability to integrate with Google as well as prospect and close deals using multiple channels. Zoho’s Free plan includes three users, 1 GB of storage, and contact management features with social integration. Standard is $12 per user per month and includes additional features such as lead scoring, forecasting, and email insights. The Professional costs $20 per user per month and also includes Twitter and LinkedIn interaction, as well as social-to-lead capture. Zoho’s Free plan allows three users and includes contact management and social integration with Twitter and Facebook in addition to G Suite. It also includes 10 email templates and a document library with folder sharing. Team collaboration lets users stay in touch with internal direct messaging. You can also integrate Zoho’s live chat feature (called SalesIQ) and track how visitors are interacting with your site. The social integration pulls in social streams to a contact’s record, allowing you to see mentions and messages and to respond to them. The ability to integrate with both Twitter and Facebook is a feature not found in any other free CRM. This makes it ideal for small sales teams with G Suite apps who want to add social selling to their tool box. The Standard plan costs $12 per user per month and includes emails insights and forecasting. Forecast revenue is based on time, commit amount, best case amount, and quota, with customizable reports. The email insights feature tracks opens, clicks, and bounces with analytics, providing metrics on each of these. Marketing campaigns can be created using Campaigns, a separate platform with tiered plans starting with a free plan allowing 12,000 emails a month and 2,000 subscribers. Campaigns syncs and can pass contacts and data to the CRM. This is best for managers and a small team of sales reps who need advanced selling data and the ability to create campaigns. The Professional plan includes the same functionality as the Standard plan, adding SalesSignals and lead capture and interaction with leads from Facebook and Twitter. It costs $20 per user per month. 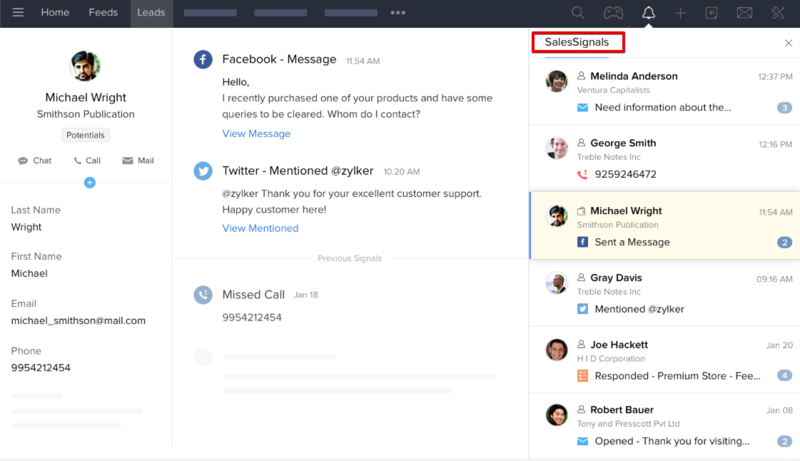 SalesSignals sends real-time notifications from customers based on actions such as email opens, survey results, marketing email opens, social media mentions, and actions taken within other third-party apps such as SurveyMonkey, Mailchimp, and DocuSign. The social lead capture function lets you add leads for Twitter based on filters any time someone mentions, likes, retweets, replies, and/or messages. Facebook-to-lead filters include posts, comments, likes, and messages. SalesSignals’ ability to send notifications from email, social, and third-party apps combined is not found in any other CRM we reviewed. This plan is ideal for companies that want to sell with the help of social media and other third-party apps. View of contact record showing SalesSignals. Image courtesy of Zoho. Zoho does not have native mobile marketing capability like that found in Agile CRM. Also, because of the limited storage (1 GB), the cost for businesses with lots of storage needs (e.g., heavy attachment files, lots of contacts) can start to add up fast. As one reviewer said, “I haven’t run across a single thing that we have not been able to make a reality.” Many found the user interface easy to navigate and appreciated that it offers an entire suite of products linked together. However, some complained that the user interface wasn’t intuitive, and that the contact records are not at-a-glance views, meaning you have to scroll down to get all of the information. For more user reviews, visit our Zoho CRM review page. Zoho is not only a powerful CRM, it also provides selling insights such as social media streams, website visitor activity, and instant, action-based notifications that can empower sales teams to prospect and sell more intelligently. Test drive any of their plans with a free, 15-day trial with no credit card required. Agile CRM is a contact management system with G Suite integration, social media integrations, and robust marketing automation. Its features allow you to create customized campaigns with event triggers using email and text in addition to managing your contacts and leads. This platform is best for businesses that want robust marketing automation capabilities within their Google CRM. Agile CRM’s free plan includes 10 users, Gmail/G Suite integration, contact management, lead scoring, and email campaigns. The Starter plan costs $9.99 per user per month, includes 10,000 contacts, three integrations, marketing automation, and social monitoring. The Regular plan costs $39.99 per user per month and includes 50,000 contacts and mobile marketing. With the Free plan, you get up to 10 users, 1,000 contacts and companies, G Suite integration, lead scoring, email tracking, and email campaigns. This combination of features is not found in any other free plan. The Gmail integration tracks opens and automatically syncs conversations with contact records. Create email campaigns using automated workflows with triggers such as Tweets, opens, URL visited, and time. The Free plan allows one integration so you can connect with Twitter and Facebook. You can also connect with LinkedIn, which is an integration not offered by the other products, to get the contact’s account feed displayed in their record. See all of a contact’s activity from campaigns, email, site visits, and more with one click in their record. This plan is ideal for a startup with limited contacts that wants to use a CRM integrated with email marketing to grow their business. The Starter plan costs $9.99 per user per month and includes 10,000 contacts, marketing automation, two-way email sync, and social monitoring. The marketing automation function lets you create basic email campaigns. For example, you can create one for onboarding a new software customer with scheduled messages throughout the process to help increase customer engagement. There’s also an A/B testing function to help find which emails are most effective. With social monitoring, you can integrate up to three accounts, seeing live streams and monitoring feeds for brand mentions in Twitter, for example. This is similar to the feature found in Zoho’s Free plan. You can also post updates, interact with customers and leads, and monitor streams for keywords. This plan is best for businesses such as SaaS startups that want automation and social integrated into a CRM. This plan costs $29.99 per user per month, includes 50,000 contacts, mobile marketing, and 10 campaign workflows and automated triggers. There are over 50 third-party integrations for apps such as RingCentral, Stripe, PayPal, Shopify, and Android for calls with mobile. The mobile marketing feature lets you send text messages using triggers for uses such as billing, subscriptions, and promotions. None of the other CRMs we reviewed have this capability. Extensive integrations and full-featured marketing automation make this best for businesses that want greater choices in how they communicate with their prospects and customers. There is no native live chat option like those found in Freshsales and Zoho. You also can’t track anonymous website visitors, which can provide valuable context for sales teams when deciding which contacts to pursue. Users like the platform’s ability to perform many tasks, such as the marketing automation feature, which uses triggers to send content by email and text. They also liked its ability to integrate with many third-party applications. Visit our Agile CRM reviews page to learn more about the platform. Agile CRM has a versatile marketing automation platform with mobile marketing and A/B testing. The social media integration—allowing users to see a contact’s feeds and interact from the record—provide another channel for prospecting. Start a 14-day trial or check out the Free plan. Streak is a simple CRM that lives inside your Gmail inbox and allows you to manage contacts, deals, pipelines, and communications straight from your email. You can create multiple pipelines, schedule and track emails, and add contacts and companies with an auto-suggest feature that pulls names in automatically. This platform is best for companies or individuals who want to manage sales directly from Gmail. Streak’s Free plan includes two users, integration with G Suite, and unlimited pipelines. There are also tasks, email scheduling, and email tracking. The Professional plan costs $49 per user per month and includes reporting, permissions, call logs, and email filtering, which automatically adds emails from a specific domain to a pipeline item. There’s a free, 14-day trial. Streak integrates easily with G Suite—you’ll see it populate in the left side navigation list of your Gmail account. This is where your pipelines will live. There will also be a drop-down menu, top right next to your G Suite app icon with settings, updates, integrations, and other options. You can create unlimited color-coded pipelines—visually similar to an Excel spreadsheet—with the option of having deals and contacts appear in your inbox as mail. This plan does not include reporting, unlike the free plans from Zoho, Agile CRM, and HubSpot. The Excel-like layout feels dated, and actions such as opening a lead from the pipeline requires checking a box then clicking an icon to open, making what should be one step, two. Therefore, the Free plan is ideal for individuals who want to work entirely from their Gmail and don’t need the ability to create reports. The Professional plan costs $49 per user per month and includes the same features as the Free plan with the addition of reporting, integrations, and email support. There are also other features such as call logs and meeting notes that let you track both with a timer, add notes, and set up a follow-up task in the same window. Reporting is one of the more impressive features because of the many filter options and because each pipeline gets its own report(s). There are two categories of reports: pipeline and sales. Pipeline can be filtered by interactions, time in each stage, and other activity-based metrics. There are sales filters for items like values (amounts) in stages, value won, won by time, close rate, and close rate in value. This plan is for teams that need to manage multiple pipelines with granular reporting options inside Gmail. The pipeline view inside a Gmail account. Image courtesy of Streak. Unlike Zoho, HubSpot, and Agile CRM, Streak doesn’t have the ability to track visitors to your website, which can provide valuable intel for sales reps. There’s also no native marketing automation feature like that found in Agile CRM. To do that, you would have to connect a third-party app (e.g., Mailchimp) using Zapier. The integration directly into Gmail is an obvious thumbs up for many users looking for a Gmail CRM. Some like that it doesn’t have a lot of features to complicate its use. However, one consistent complaint is that it doesn’t have marketing automation built in. To see in-depth reviews, visit our Streak user and reviews page. Streak puts a CRM right in your Gmail account, making it convenient to manage the selling process from a familiar place and without having to toggle between apps. There’s also support capability with ticketing. You can sign up for a free, 14-day trial for the Professional version. HubSpot’s free CRM has Gmail integration, unlimited users, and storage for up to 1 million contact records. It also includes contact and deal management, activity tracking, and email tracking. Live chat, a chatbot, and support ticketing round out the features with all communications captured in a central inbox. This makes it best for businesses that want a free, basic CRM with support features and little to no limitations on users or contacts. The free HubSpot CRM allows unlimited users and up to 1 million contacts. It’s the database that powers all of the “hubs” in the platform: service, sales, and marketing. Upgrades to the three hubs can be purchased together as a Growth Suite starting at $150 per month (1 user) or individually starting at $50 per month. The CRM includes contact management and activity, ticketing, canned snippets, conversational bots, and a conversations inbox. It also comes with a sales, marketing, and service hub. These three hubs give additional features such as forms, email templates, and email scheduling. The email integration works with Gmail, G Suite, Outlook, and Outlook 365. All are simple to install. It took me about a minute to install my G Suite and the Chrome extension that pulls in company, contact, and deal data for contacts and displays in a column with Gmail. If they are not a current contact, you’ll be prompted to add them to the CRM with one click. This extension was the most reliable of any that I tried. Once you create a contact record, your emails are synced with the CRM. Every time you send an email from Gmail, the thread will be added to the contact’s record. You can also send emails directly from the CRM. Sync your Google Calendar with a customized meeting scheduler with a link in your email signature. While composing an email, you can easily attach items you’ve created in the CRM, such as email templates, documents, meeting scheduler, and more. 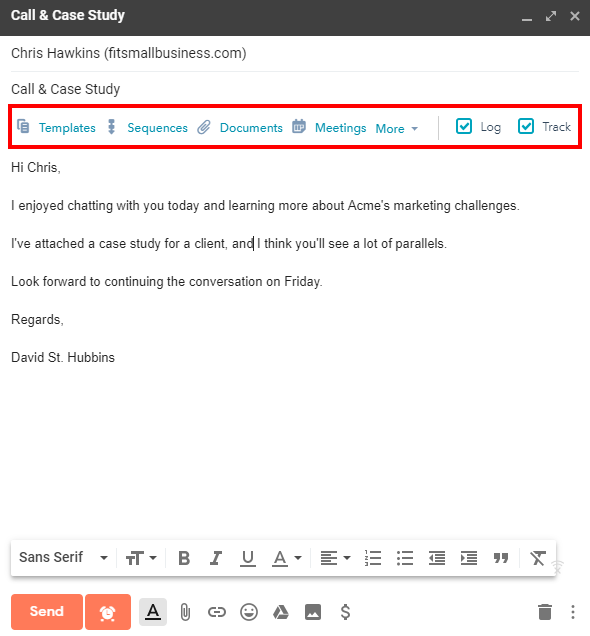 HubSpot email extension in Gmail. The user interface is clean and intuitive with the entire platform’s features shown at the top with drop-downs for subcategories (e.g., contacts, conversations, marketing, reports). Features available but not included are shown with a lock icon. Within “sales,” you can access deals, tasks, documents, and meetings. Deal stages and properties can be customized and deals can be dragged and dropped along the kanban pipeline. The Tasks section shows open tasks users have created within a contact’s record and can be filtered by user, type (to-do, emails, calls), and by time. Queues can be added to further segment tasks by type. For example, create queues for service, support, and sales. In Documents, you can add proposals, product sheets, or whatever you need to access for leads and customers. The free CRM also provides some additional features such as website forms and lead flows in order to capture leads. A lead flow is a three-step lead capture form configured as a slide-in box, drop-down banner, or pop-up box. It’s customized for page location, design, messaging, and time on page, among others. This feature is only found in one other CRM we reviewed. Live chat and chatbots are included in the CRM, accessed from the “conversations” inbox and added with a code snippet to each page. With live chat, you can customize the chat window and the welcome message and automatically route chats using predefined rules, such as first available or team member online. The bot can collect visitor information, book a meeting with a rep, and create a new ticket. These chat features are not found in any other free CRM. HubSpot is most known for its marketing platform, but none of this functionality is included in their CRM, unlike those offered in Freshsales and Zoho. It also limits email tracking to 200 emails a month unless you upgrade to the $50 per user per month Sale Professional. HubSpot’s CRM is known for its ease of setup and use, and users generally agree with this. The website visitor tracking was also noted as particularly valuable for providing context for sales reps. There are complaints that everything requires an extra payment, and that is true if you want upgrades beyond the base system, which can add up quickly. HubSpot’s CRM is free forever and includes Gmail integration, unlimited users, and room for up to 1 million contacts. The email extension provides quick access to functions in the CRM directly from Gmail and provides valuable contact information as you compose an email. 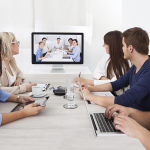 The service features, like live chat and support tickets, make this a solid, unified communications platform. Visit HubSpot to start integrating your CRM with Gmail for free today. Freshsales is a full-featured CRM offering G Suite integration, sales campaigns, and a great deal of customization options for contacts, deals, pipelines, and sales activities. Email functionality includes bulk send, scheduling, tracking, and two-way sync, which lets you send emails from Freshsales or Gmail and see those emails in the sent folder of both apps. This is ideal for businesses wanting an all-in-one CRM with outstanding customization. Freshsales’ Free plan comes with G Suite integration, unlimited users, and contact management. The Blossom costs $12 per user per month and allows bulk email send, sales campaigns, and tracking. The Garden plan is $25 per user per month and adds lead assignment rules and forecasting, while the $49 per user per month Estate plan adds a dashboard and visitor tracking. The Free plan provides G Suite integration, unlimited users, contact and deal management, and lead scoring. There’s also a Chrome extension that will show sales history, recent activities, tasks, and deals for leads and customers in the sidebar of Gmail. Lead scoring lets you assign a value to leads based on predefined criteria such as lead properties and email and web activity. The Free plan is, however, missing reports and storage ability unlike what is found in Zoho’s Free plan. However, if you’re a one-person operation and want basic contact management and Gmail integration, the Free plan is a good option. Blossom includes 1 GB of storage, two sales campaigns, and costs $12 per user per month. You get a mobile app, email sync, tracking, scheduling, and standard reports. Send 250 bulk emails per day and get real-time email alerts for email opens, tasks assigned, appointments scheduled, and when deals are assigned. Reporting is minimal compared to any of the other software we reviewed at this price point—the only one available is the standard report with no customization and no forecasting. The Blossom is best for a one- or two-person team that wants basic contact management, bulk email sending, and email tracking and notifications. The Garden plan is $25 per user per month with 2 GB storage each, 500 per day bulk email sends, and up to five sales campaigns. It also provides a lot of additional reporting beyond the Blossom plan such as sales forecasting, sales activity, and velocity and trendline reports. You can also create your own reports. However, missing is a reports dashboard like that found in Zoho and Agile CRM. The other feature that stands out from the two previous plans is multiple pipeline creation. This is essential for businesses that sell different lines (e.g., product, service) with different sales cycles and stages. The Garden plan is ideal for businesses that have multiple business lines and need more granular reporting capability. The Estate plan adds website visitor tracking and a reports dashboard to the features found in Garden. It’s $49 per user per month; it bumps up daily bulk email sends from 500 to 1,000 and sales campaigns from five to 10. The highlight of this plan is the customization: leads, contacts, accounts, deals, pipelines, scoring, and sales activities are all configurable. For example, customize the types of sales activities available with specific outcomes for each activity. Lead scoring includes filters for property, email activity, application, and web activity for greater insight into a lead’s sales readiness. For example, create a lead score filter by job title (authority) and keyword (need). Based on these criteria, the lead is scored as cold, warm, or hot, giving a sales rep an idea of buyer intent. This plan is ideal for businesses that have a high number of prospects in different business lines and need customization to manage them. Sales activities customization. Courtesy of Freshsales. There is no ability to do mobile marketing and texting within the contact record, as found in Agile CRM. You also can’t pull in social media feeds from Twitter and Facebook for social selling like you can in Zoho and Agile CRM. Many users like that it handles all of the tasks required to run a sales team, such as pipeline and conversation views. There are lots of comments about their excellent customer support. Some found the Chrome extension to be glitchy, which was true in my experience. For example, it wouldn’t recognize a contact I had created while in Gmail. I had to use the extension search box to see the contact. To read in-depth reviews, visit our Freshsales review page. Freshsales includes features that most businesses will find helpful, such as the G Suite integration, lots of email functionality, and customization options for the way your team sells. You can sign up for a free, 30-day trial for any of the plans by visiting their website. Pipedrive has an intuitive, easy-to-navigate interface with drag-and-drop functionality combined with Gmail sync, unlimited contacts, and unlimited pipelines. Create multiple dashboards and track personal, team, and company goals and connect over 100 third-party apps with the integrations feature. This CRM is ideal for companies that want a visually-oriented pipeline interface. All three of Pipedrive’s plans offer Gmail integration, unlimited contacts, multiple pipelines, and advanced reporting tools. Pricing ranges from $12.50 per user per month to $49.17 per user per month. The Silver plan tracks email opens and clicks while the Gold and Platinum plans add email sync, templates, and a products catalog. The Silver plan includes Gmail integration and Calendar, Contacts, and Drive sync. You can have multiple, customizable pipelines with deals that can be dragged-and-dropped along stages or into other pipelines. Goals let you set goals by user, pipeline, expected outcome (e.g., amount of deals or revenue), interval, and duration. This can be done at the company and user level. Deal rotting provides a visual notification of any deals untouched for longer than a defined period. This is handy if you have a lot of deals and need a quick way to assess them; this is a feature not found in any of the CRMs we reviewed. The Silver plan is ideal for teams that need to manage multiple pipelines with goal tracking for each. The Gold plan costs $24.20 per user per month and gives advanced permission sets that are customizable for managers and users. Email sync pulls in your Gmail inbox to the CRM and automatically sends emails to the contact record. Emails opens and clicks are tracked and you can add templates with one click during composition. You can create a products database with name, code, and price that you can then pick from while creating a deal. This feature and the advanced emailing make it ideal for sales teams that want to save time by working in one platform for email and easily adding products to a deal. In addition to all of the features found in Gold, the Platinum plan also includes multiple dashboards, revenue forecast reporting, teams, and team goals, and costs $49.17 per user per month. Teams lets managers follow the progress of their team for items like pipeline and forecast. Team goals track a specific team’s sales objectives. The revenue forecasting report shows the money your business should be receiving, calculated from won and open deals based on probability. The Platinum plan is best for teams that need more reporting capability, including forecasting and tracking performance by team. There’s no built-in email, marketing automation, or lead scoring like what’s found in Zoho. To get this functionality, you would have to connect to a third-party app like Mailchimp. The product’s feature is an easy way to add service or product items within a deal, but there’s no native tool to convert these deals to quotes. Many users like how simple it is to use and set up for functions like email integration and creating pipelines. The ability to create multiple pipelines for different business units is also a plus. However, some dislike that it doesn’t support campaigns for email. Visit our Pipeline reviews page to see what others are saying. Pipedrive’s easy Gmail integration, unlimited contacts, and unlimited pipelines let sales teams focus on sales and not the limits of their CRM. The customizable reporting by activities, pipeline, sales, and goals lets managers focus on tactical and overall performance. You can sign up for a free, 15-day trial. Google CRMs integrate easily with Gmail and the Google Suite of applications, making communication easy whether you’re in your email inbox or a contact’s record. Emails are captured and logged in the CRM and Gmail inbox, and can be synced, tracked, scheduled, and set with alerts based on prospect or contact activity. The best CRMs have these features along with more advanced features such as email automation, lead intelligence, and visitor tracking. Zoho’s CRM combines full G Suite integration with added selling tools such as sales insights, lead scoring, and social media integration, giving sales teams the tools needed to close more deals. Test drive any of this Gmail CRM’s plans today with a free trial.